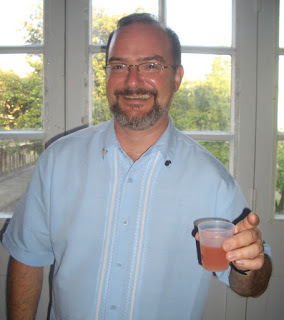 On Thursday at Tales of the Cocktail at the cocktail reception held at the Presbytere, my third drink was an Allspice Sour made by John Lermayer; however, he did not have a recipe on hand to share. My next drink was an original by Paul Clarke of the Cocktail Chronicles called the Dunniette. This drink was very refreshing, not too sweet, pretty colored, and strangely tasted a lot like pink grapefruit. Indeed, the Aperol and St. Germain made for a very nice pairing of flavors which seemed to benefit from the crispness of the lemon juice. Paul commented that the Dunniette was the "son of the Jasmine", perhaps because Aperol is less bitter than Campari. Here the Jasmine's Cointreau is swapped for St. Germain which adds some more complexity back into the equation instead of orange-sweetness. This cocktail would not be the last time at Tales that Paul Clarke mixed head to head with professional bartenders, for he competed valiantly the next night at the On The Fly event. Bully for bloggers getting taken seriously!